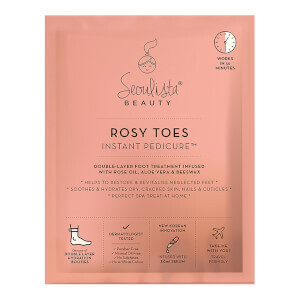 Synergising natural ingredients and new Korean innovation, the Seoulista Beauty Rosy Hands Instant Manicure™ works to nourish skin, nails and cuticles in just 30 minutes. Enriched with Beeswax, Vitamin C and Bulgarian Rose Oil, the patented anti-ageing treatment softens and conditions hands, whilst providing antioxidant protection to repair dryness and minimise dark spots and pigmentation. 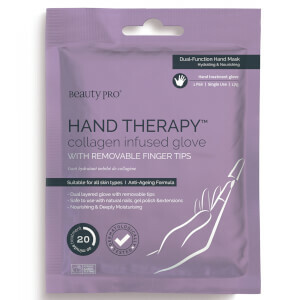 The serum-infused gloves leave hands feeling smooth, youthful and deeply replenished with a delicate scent. 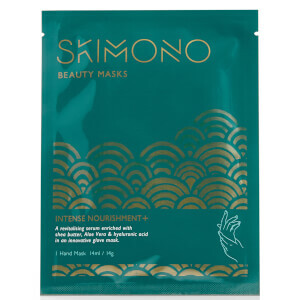 Free from parabens, sulphates, mineral oil and artificial colours. Clean hands thoroughly. Remove the gloves from the pack and gently separate them. Smooth onto your hands and use the paper strap to secure. Allow serum to infuse for 30 minutes before disposing. Smooth remaining serum into the skin. Do not wash off. Wait 10 minutes before filing nails or applying nail polish. Aqua, Cetyl Ethylhexanoate, Butylene Glycol, Glycerin, Cetearyl Alcohol, Urea, Stearic Acid, Palmitic Acid, Glyceryl Stearate, Polysorbate 60, Cyclopentasiloxane, Cyclohexasiloxane, Dimethicone, Peg-100 Stearate, Sorbitan Stearate, 1,2-Hexanediol, Caprylyl Glycol, Carbomer, Triethanolamine, Caprylhydroxamic Acid, Illicium Verum (Anise) Fruit Extract, Pelargonium Graveolens Flower Oil, Simmondsia Chinensis (Jojoba) Seed Extract, Adenosine, Disodium Edta, Milk Protein Extract, Betaine, Rosa Damascena Flower Oil, Butyrospermum Parkii (Shea) Butter, Ceramide 3, Paraffin, Theobroma Cacao (Cocoa) Seed Butter, Eucalyptus Globulus Leaf Extract, Lavandula Angustifolia (Lavender) Extract, Melaleuca Alternifolia (Tea Tree) Leaf Extract, Melissa Officinalis Leaf Extract, Mentha Piperita (Peppermint) Leaf Extract, Mentha Spicata Flower/Leaf/Stem Extract, Pelargonium, Graveolens Extract, Rosmarinus Officinalis (Rosemary) Extract, Thymus Vulgaris (Thyme) Flower/Leaf Extract, Tremella Fuciformis (Mushroom) Extract, Citronellol, Geraniol, Linalool. I love the Seoulista products, I use them frequently as at this price they're excellent for what they produce. I use Rosy hands once a week and my hands and nails have never looked better. My hands and nails looked great after using Rosy Hands. Very useful that I can even use my iPhone while the gloves are on! A really handy manicure to have when you don't have time for a full salon manicure.